Game 1 of the NBA Finals is in the books and tonight the Cleveland Cavaliers and Golden State Warriors will get into Game 2. 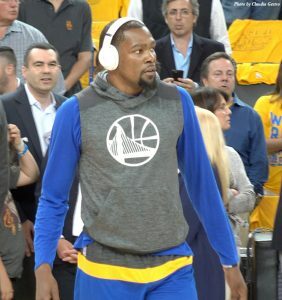 In Thursday’s game Kevin Durant (pictured above), the All Star forward of the Warriors, took over the game, easily going to the basket for layups and dunks, plus he shot from the perimeter as well. And he was great on defense. He finished the night with 38 points, eight rebounds and eight assists. Stephen Curry had 28 points with ten assists, six assists and three steals. Ten other Warriors contributed points as well. Cavaliers forward LeBron James scored 28 points, with 15 rebounds, eight assists and two blocked shots, but he committed eight turnovers. That was the main story of the game for Cleveland: turnovers. Kyrie Irving had 24 points and four turnovers. Their center, Tristan Thompson had only four rebounds, but didn’t score. He had only one T/O. Cavs forward Kevin Love had a big impact on the game with 15 points and 21 rebounds, but he struggled with his offense, going just 1-7 from the field. He did have three blocks so he performed well defensively. Besides Love, James and Irving only four other Cavaliers contributed points, none of them in double digits. That was the other big story for Cleveland: a lack of offense. To win game 2 the Cavaliers will have to tighten up their defense and try to take advantage of the few mistakes the Warriors might make — and slow down Kevin Durant. The home crowd in the Oracle Arena was treated to an offensive show, watching Durant score inside and from the arc. He had 3 of 6 three-pointers. Stephen Curry was 6-11 from outside the arc. Golden State needs to continue their defensive dominance in the game, but need more offense from key players like Klay Thompson, who had only six points, but played great defense. Andre Igoudala had seven and Draymond Green had nine, plus 11 rebounds, two assists, two steals and one blocked shot. Which means the Cavaliers will have to play hard for 48 minutes to get around or through Golden State’s aggressive defense. Game 2 will be another great game between two teams that have met each other in the Finals for three straight seasons. The Warriors won in 2015 and the Cavaliers won it last year, after losing the first two games at the Oracle Arena. It would be wise not to count the Cavaliers out because the Warriors won that first game 113-91. Cleveland has the talent and power to make a big comeback. Below are our video reports by Claudia Gestro from Game 1, the opening of a new “Learn and Play Center” in Oakland, attended by members of the Warriors team, Mayor Libby Schaaf and the commissioner of the NBA, Adam Silver. And then there is the report from the practices on Saturday. BBM Bio Pharma Labs is sponsoring our reporting from the NBA Finals and the Stanley Cup Final. They provide supplements and other products for a healthy lifestyle. UPDATE: the Warriors just announced head coach Steve Kerr will be back on the bench directing his team. He missed most of the playoffs due to problems that stem from back surgery almost two years ago. He told the media he is back for the duration of the Finals, not just one game. In truth, his team’s seams appear to be tightly woven at the moment. We will see if the Cavaliers can take them apart tonight. UPDATE: The Golden State Warriors are now just two games away from winning their second NBA title in three years. They could actually make history by winning both games in Cleveland when the series moves to the Cavaliers home court at the Quicken Loans Arena. Golden State has not lost a game in the playoffs this season. The Cavaliers made some adjustments to keep up with the Warriors and in the first quarter they either led or stayed within six points of Golden State. In the second period Cleveland outscored Golden State by three, 30-27 and at the half the Warriors only led by three, 67-64. But in the third quarter the Golden State took over the game, outscoring Cleveland, 35-24. In the fourth quarter Cleveland made a run, but Golden State still stayed ahead and in the end were too much for the Cavaliers. The final score was 132-113. LeBron James had a triple double with 29 points, 11 rebounds and 14 assists. Kevin Love had 27 points, but only seven rebounds. Kyrie Irving had 19 points and seven assists. Kevin Durant led all scoring with 33 points and had 13 rebounds. Stephen Curry had a triple double with 32 points, 10 rebounds and 11 rebounds. Klay Thompson improved his offense from Game 1 scoring 22 points. Shaun Livingston and Ian Clark each had 10 points in the game. Game 3 with be at the Quicken Loans Arena in Cleveland, OH on Wednesday, June 7, at 9 p.m. Eastern Time.